This mysterious and unlabeled image--seemingly a 19th Century anatomical plate from India?--found on Wunderkammer. 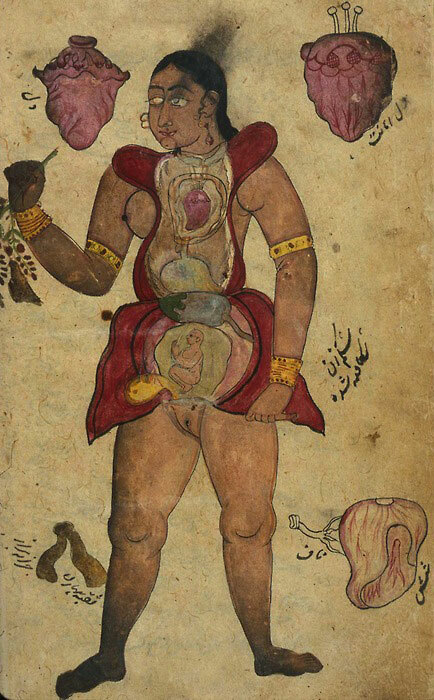 Update: This plate is from a book called Tibb-i Akbar or "The Medicine of Akbar" published sometime in the 18th Century. Full attribution here. Thanks to BibliOdyssey for the attribution! Hi,This is awesome but I'm pretty sure that this is from a persian manuscript - my biosciences professor has excerpts framed in his office (this being one of them) and they're listed as persian. no it is in farsi, I am persian and I can read all words, urdu has lots of persian words. but this is totally farsi.